UNU-EHS is actively engaged in education. It offers the Joint Master of Science Degree programme “The Geography of Environmental Risks and Human Security” with the University of Bonn. 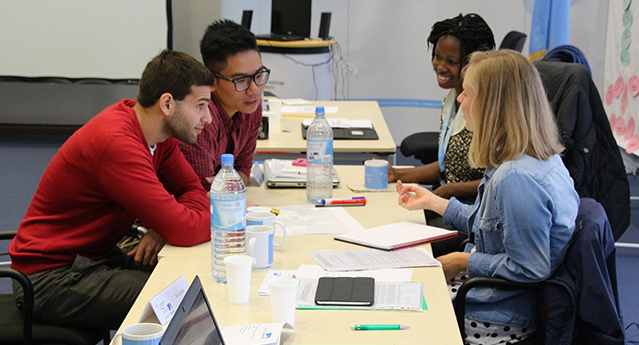 UNU-EHS also hosts a number of international PhD projects as well as courses on a variety of global issues related to environmental risks and sustainable development. The institute provides a truly international educational experience with first-hand research and learning activities linked to the work of the United Nations and its specialized agencies, as well as numerous intergovernmental processes. The institute welcomes students from all over the world who are committed to the pursuit of progress and sustainable development through research, training and dialogue with a global community of academics in developed and developing countries. UNU-EHS is part of the global UN University network which spreads across 13 UN University research and training institutes. For information about other UN University institutes’ educational programmes please consult the homepage of UN University Headquarters in Tokyo http://unu.edu/admissions or directly connect with the UNU institute of your choice http://unu.edu/about/locations.